Lovely fishing town established on a tropical bay where we will find perfect FLAT water. During the 22km Downwind the long small waves will be a constant, nice and easy ones to start enjoying. On Almofala the 4x4 pickup will be waiting for us with lots of Açai for us to recharge energy! Another beautiful fishing town that has been growing a lot the last couple of years. Every year Barra Grande welcomes the World Championship and the Brazilian tour. You can even find a kite park on the sea- extreme! We have reached the Northern point in our trip. There is so much beauty on this place that speaking about will most likely ruin all the magic- in case such thing is even possible. A huge desert full of lagoons everywhere, nothing else to say. We believe that the goal in life is to enjoy the journey. Our goal is to offer a proposal to live unforgettable moments. 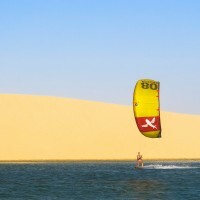 We invite you to be part of Nomade do Kite living a great experience touring areas that combine mystical characteristics; strong winds, virgin beaches, perfect weather and the magic colors that only Brazil can give.